Today I received a box of newly printed copies of my 1987 tape music collection Morpheus that has been handsomely re-issued on CD for the first time in a re-mastered and hand-numbered edition of 200 by the Belgian label Forced Nostalgia. The 30 or so copies I received are my compensation for agreeing to allow Fré De Vos, the label's director, to re-publish this nearly 30-year old work. Though it's a bit of a questionable undertaking to release anything on CD at this moment in history, it's gratifying to have a reiteration of an early work, especially one which at the time I felt so strongly about. The discs however, look and sound great! Fré contacted me about this possibility nearly ten years ago, and for various reasons it has only now come to fruition. Though we have never met in person or even spoken on the telephone, I am very grateful to Fré for his interest and perseverance. The recording is representative of the work I produced during the latter half of the 80s while I was immersed in the international cassette music underground, a period during which I self-released three full-length works on cassette, as well as a split tape (with Cyrnai) and contributed to numerous compilations. Those years were arguably the heyday of the cassette trading period, when a vast international network of homespun labels and distributors vigorously traded artifacts of every description among its artist-participants. The audio cassette naturally ruled the day, lending itself as it does to self-production. We all had our own dubbing decks (a dual cassette deck that facilitated copying tapes) and typically made our own covers and packaging, often making each copy unique in some way. Visits to my PO box in Adams Morgan (Washington, DC) were almost always thrilling for what might turn up – a box of tapes by other artists I ordered in trade for my own; letters and postcards from Japan, England, Tennessee, Switzerland, Austria, Seattle! Unsolicited tapes, chain letters, fanzines, catalogs and other often un-categorizable miscellany, arriving sometimes daily. It was a stimulating time, though also isolating in its own way. I was still living in DC then where I spent a number of years active in the local punk scene. Retiring from bands at 19 and having dropped out of two different universities, I was eagerly searching for a sustainable musical identity that didn't involve dysfunctional families, drug addictions, drunken brawls or broken eardrums. With my cassette four-track recorder and any instrument I could get my hands on, I dove in head first. For several years I did little else apart from supporting myself as a waiter and bartender, producing hours and hours of recorded works in what might be described as ambient-industrial, dark ambient, noise, new age or soundscape. This idiom, such as it was, contained equal parts Eno, Throbbing Gristle and Cage and had a great many adherents throughout the world. Some of those with whom I engaged in regular correspondance included Robert Rich, Jeff Grienke, TS Vickers, If Bwana and Zoviet France. Sharing our impressions and trading tapes created a sense of camaraderie and community, though it was largely an imagined one. This musical practice had little performative potential and little local presence, and though I did develop a regular live project at that time with the cellist Rogelio Maxwell, the world of homemade tape esoterica ultimately left me more alone with my music than I cared to be. By 1989 I abruptly dropped the whole enterprise and begin a period of formal composition studies that would, by 1991, take me to California to study at CalArts, and then on to a career as a more conventionally formal composer. When I completed Morpheus I remember feeling completely satisfied, as though were I to never create another musical work, I would be ok with that. I had been struggling to find a voice for some time, and at that moment this was it. It was well received among friends as well as in the network through which it travelled. Having sold out of the first batch of 100 that I had mass-produced, I re-printed another 200, of which I still have a boxful. The covers were hand set and printed separately, a process directed by my friend Henry Adams (aka Warwick) who lived nearby at the time and worked in graphic design. All told, Morpheus was about as successful as I might have reasonably expected a self-produced cassette of dark and mournful subterranian soundscapes to be. Which brings us to 2015. My musical practice today is not much closer to the mainstream than it was in 1987, but it has a lot more people in it and includes a far greater diversity of activities. I have traversed many different musical questions, communities and modes of productions in these years, and while I rarely look back to my former selves, I also don't renounce them. In recent years I have found many different ways in which my musical past informs my present, and that includes my industrial self which finds expression at times in my electroacoustic work for hammer dulcimer. Also recently, I have had the unexpected opportunity to reconnect with some of my contacts from this period, notably Al Margolis ("The Cassette Godfather") who currently runs a number of experimental new music labels including his own label Pogus, and Ken Montgomery founder of the famed East Village cassette music store and gallery The Generator. I have also re-connected, virtually at least, with Zoviet France, the amazing and enigmatic collective from Newcastle upon Tyne who for me represent the highest achievement of this particular branch of the underground family tree. I regularly tune in to their weekly one-hour radio program and podcast A Duck in a Tree that features music of this type, both current and historical, as well as a wonderful variety of field recordings made throughout the world. 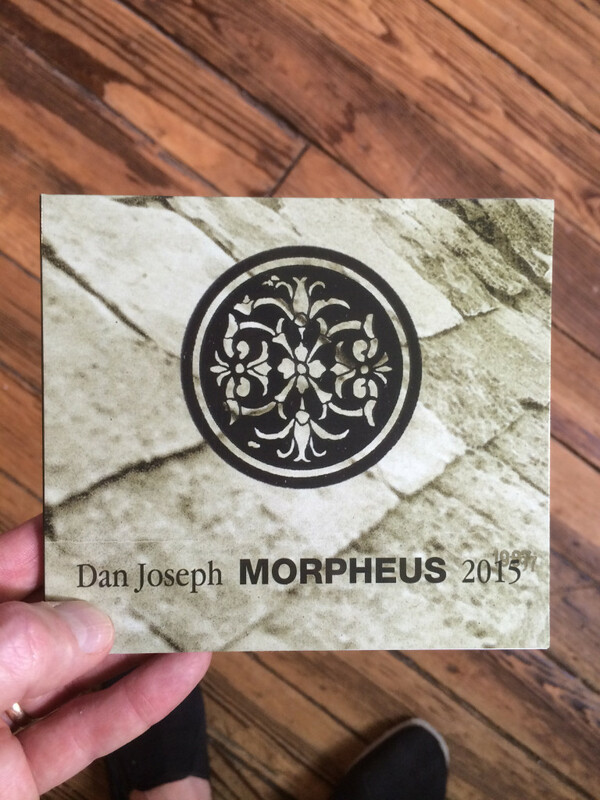 I am very happy to be plugged-in to this community again, and very happy to see Morpheus have a second life! Comments closed — Trackbacks closed RSS 2.0 feed for these comments This entry (permalink) was posted on Tuesday, May 12, 2015, at 1:53 pm by danjoseph. Filed in Recording and tagged 80s, ambient, cassette, DC, drone, industrial. Thanks for reading and for commmenting! I look forward to listening to your FN releases. Thanks for alerting me.